If you aren’t up-to-date on the national calendar for both official and unofficial holidays, it may be news to you that National Good Neighbor Day takes place on September 28th. The purpose of this holiday is to acknowledge your neighbors’ kindness and amicability. Your neighbors may be the ones you rely on to watch your home when you are away on vacation or to lend you household supplies when you run short. Regardless, it’s worth going out of the way to show your appreciation. Check out a few ways to celebrate National Good Neighbor Day with a little help from us here at Teleflora. Help out with yard work. If you have an afternoon to yourself, offer to help neighbors mow their lawns, do some gardening or rake leaves. Cook a meal or bake a treat for them. Nothing puts a smile on someone’s face quite like a fresh batch of chocolate chip cookies. Bring them coffee from their favorite coffee shop. Maybe even throw in a muffin or donut. Water their plants when they go on vacation. If your neighbors are leaving town for an extended amount of time, offer a helping hand to keep their plants healthy. Offer to pet-sit their animals if they plan on going away. This will save them the trouble of hiring a dog-walker or house-sitter. On National Good Neighbor Day, try to go out of your way to do something helpful or thoughtful for your neighbor. You might leave a kind card in their mailbox, or get them a present, such as a flower arrangement. If you know your neighbors’ favorite colors, you might opt for arrangements that suit their preferences. Otherwise, purchasing a seasonal arrangement is a kind way to remind your neighbor that you appreciate their acquaintance. 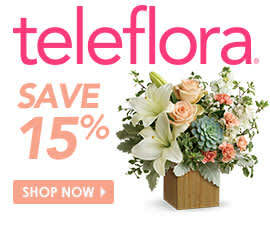 Teleflora’s collection of fall flowers is made up of stunning arrangements that match the hues of the autumn foliage. Whether they are long-time neighbors or ones that just moved in, a bouquet from Teleflora and a few small acts of kindness are thoughtful ways to remind them of your appreciation.